[miau] It’s a Friday night, and you’re bored. You’ve flipped through the TV stations five times, and nothing new or remotely interesting has made its way on. So what’s a guy supposed to do? You roam the internet, now looking for something to cure your boredom on here rather than on the TV. Looking for games? There’s quite a few, so where do you even begin to look? You first need to find the perfect type of game that fits your want. How about a slot machine? 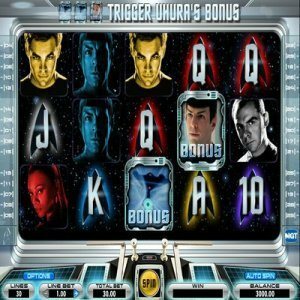 Star Trek Slots by International Game Technology is a game based off the hit sci-fi movie that’s made its name over the years, that has a captivating online game play that will be sure to have the ability to occupy you for as long as you allow it. You’re able to see the characters you’ve come to know and love, you have amazing graphics to look at, and you’re given a great score as well that’s not only pleasing to the eye, but to the ear as well. Could it be too good to be true? Not only isn’t it beautifully put together, but you’ll also have the ability to win real cold hard cash to put away in your pocket. Star Trek Slots is exclusive to its creator IGT, and is ready for you to take it on a ride to the galaxy. Star Trek features a 5-reel slot and has 30 paylines available to its players that choose to take on the challenge. The game which was inspired by the original movie, shows pictures of the film and its characters, and even includes the original symbols the movie used. It shows Star Trek characters Captain James Kirk, Spock, Scotty and Uhura, all in their original colors. The Star Trek logo serves as the ‘bonus’ symbol. During game play, the bonus rounds feature the best graphic throughout the game, being the highest quality and the most detailed. The bet line is between 1-10 dollars, which is perfect for both amateurs and avid players of the slot machine genre. The minimum bet you can place is 0.01. The game is available for play through flash player, which means you will not have to download any software to play the game. The bonus rounds include ones with Captain Kirk, Spock, Uhura, and Scotty, which all feature their own special game play and rewards that can be won if played. All in all, the game is a great game to play whether you’re an avid player or not, and it serves a great way to earn some cash (if you’re not residing in the United States, Canada, Australia, Germany or Italy), and to pass some time if need be. With great graphics, easy to navigate buttons and great game play, I would recommend searching the game and giving it a try for yourself.